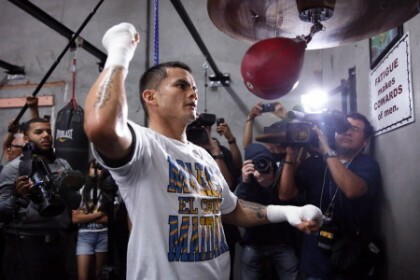 (Photo credit: Stephanie Trapp/Showtime) Marcos “El Chino” Maidana is an underdog, a big bowser in his matchup with Floyd “Money” Mayweather, Jr. Those who are trying to justify a bet on the Argentinian, bank on his punching power. When he clobbers guys, they go down. The key, of course, is the knuckle buster has to land, and It’s doubtful that will be the case come May 3rd. After all it wasn’t enough against Devon Alexander, Amir Khan and Andreas Kotelnik. His followers might be putting too much importance on his win over Adrien Broner, because Broner’s style is like a poor man’s Money. The truth is Broner comes up short in his attempt to fight like Floyd Mayweather, Jr. He might use the the shoulder roll and makes similar use of the right, but his execution is a poor man’s imitation. It’s not for lack of effort, but he doesn’t have the foot speed or reflexes of Floyd, Jr. But, what fighter does? Consequently, Maidana fans shouldn’t get too excited over the then undefeated Broner. Saying Maidana has the style, not the power, to beat Money might be closer to the truth. That’s because Maidana’s style is really an “unstyle” (sic) or no style. Don’t think that’s true, then go ahead and try to describe Maidana’s style in the sense of predictability. Can’t do it can you? That’s because his opponents have no idea what he might do next, or from which direction his next punch might be coming. It’s tough to defend against that kind of uncertainty. His opponents don’t know what to expect next. Part of Maidana’s success also comes from trying to muscle his opponents, not only to tire them but to intimidate them as well. He will bust a gut trying to bulldoze them into proper position for one of his power shots. He’s like the bully trying to get your lunch money. If you back down, it’s only going to get worse. Don’t rely on the referee either. A warning or two for illegal tactics won’t faze him a bit. He will continue to strain and sweat in his attempts to turn this attempt at marquess of queens berry into a brawl. Maidana thinks he can win if the fight turns in that direction. The rougher the better. He knows that’s his only chance at landing a knockout blow. Why don’t the odds makers give Maidana more of a chance, knowing that he has that unpredictability of a brawler in his favor? The answer is they have seen fighter after fighter try to get rough with Floyd. It hasn’t worked. Most of the time Floyd is not there to rough up. If Floyd is stationary and his opponent attempts to pressurize him, Floyd will make wicked use of his elbow(s). His antagonists start eating a little hard pointed bone. It slows them down and marks them up. Another area overlooked a bit is Floyd’s strength. He is very hard to muscle, not only because he is strong, but also because he has great balance and knows how to maneuver opponents and use leverage to exploit their weaknesses. The odds makers are usually right. They know loyal fan’s visions of success are usually nothing more than pipe dreams. Fans’ yearning for success too often result in a letdown. Their hopes for a rip snorter often result in something with a waddle. Another promised biggie goes down in defeat. Floyd confidently walks away, knowing that his superior skills resulted in yet another triumph. He put down yet another palace revolt, and he did it with a master stroke, a stroke of boxing genius.